After its launch in 2007 the original edition of Best Birdwatching Sites: North Wales quickly established a reputation for delivering trustworthy information about key birding locales in a very reader-friendly format. Alan Davies was ably assisted by Owen Roberts, co-author of the Birds of Pembrokeshire and between them they covered 58 major sites, plus a cluster of smaller sites surrounding Wrexham. As stock of the original volume began to run down, author Alan Davies and his partner Ruth Miller took the opportunity to revisit all the sites to ensure the new version was as accurate and up-to-date as possible. All the 58 major sites covered in the 2007 book reappear in revised form, as do the 17 minor sites clustered around Wrexham. Where necessary site maps have been updated. As a majority of active birders now use satellite navigation systems, the new book contains postcodes and GPS co-ordinates for all sites. Birding tips for each site, based on the authors’ personal experiences. Detailed maps and directions to each site. Valuable background information for new visitors to North Wales, including Anglesey. Target birds for each site – and a measure of how likely they are to be seen. What birds to expect, month by month. A glossary of Welsh place names with their meanings in English. 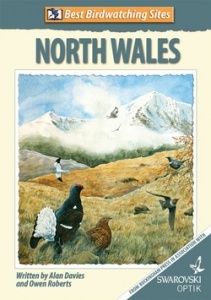 A list of bird names in Welsh plus a Checklist of North Wales birds.